Feedback is an important and crucial aspect which can do two things – motivate or discourage. Either way, feedback is necessary and required. And now, we are not only talking about feedback in the corporate culture. 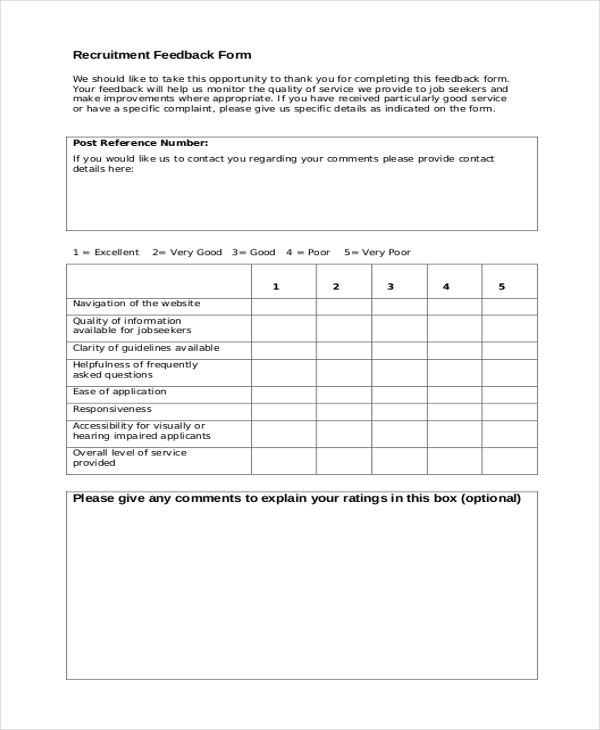 Feedback forms are available in abundance and in many types and formats. Each kind of feedback form is designed and built in a particular way to deliver its purpose. These forms are important documents and pointers given to them should be taken with seriousness and earnestness. 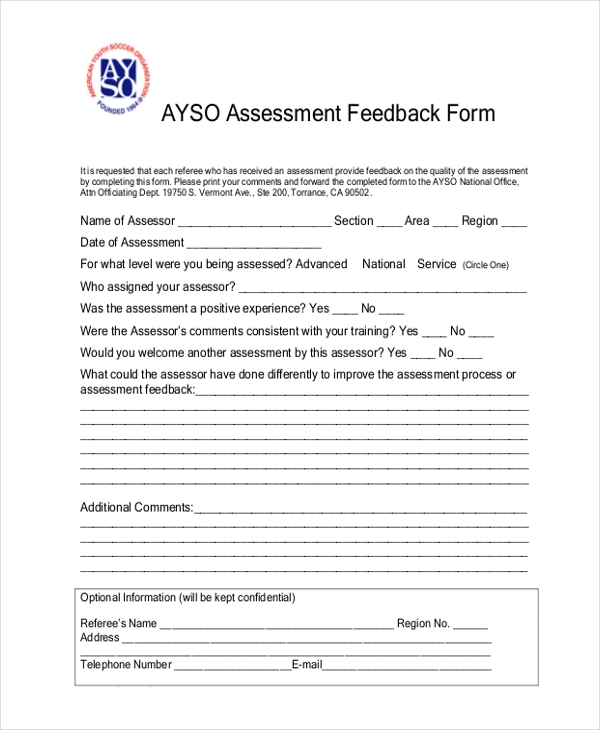 In many companies, outlets and line of work, assessment feedback forms are frequently used as the tool to express or convey an opinion by means of giving feedback on an important matter or individual. Assessment feedback forms differ in design and format. An appraisal feedback form is used in situations where an employee’s salary revision or job promotion is at stake. The appraisal form contains many pointers which need to be duly scored or remarked, and then on that basis, the form is forwarded for further consideration. 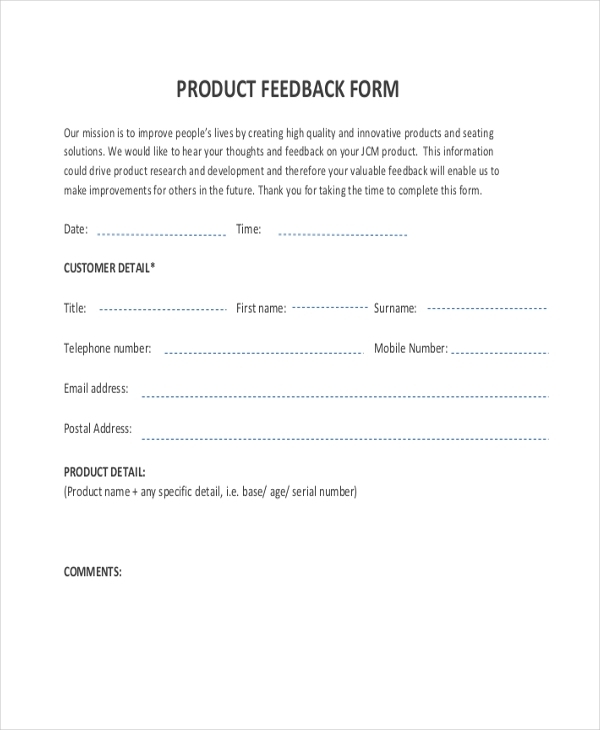 Brands and businesses use this customer feedback form to learn a customer’s opinion and views about their products and services. Depending on the target product or service, and the target audience, the content of a customer feedback form are formulated accordingly. 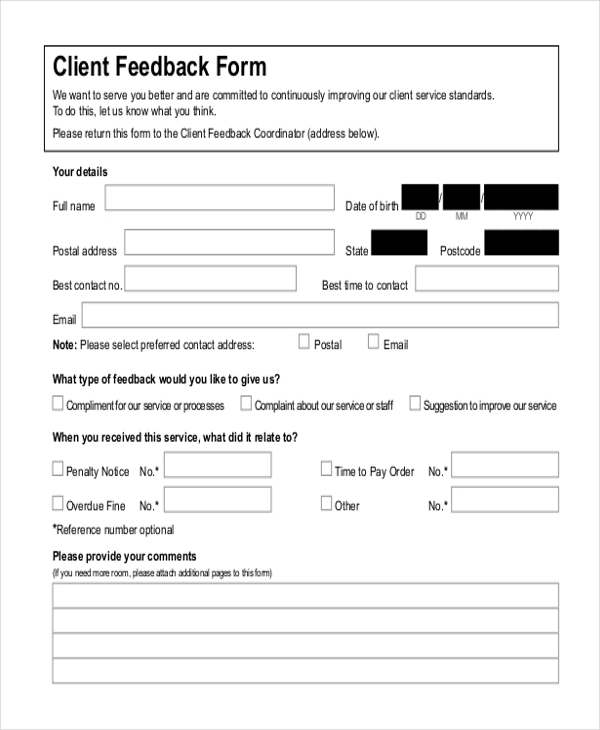 A customer feedback form is also known as a client feedback form. The crux of its usage is to be used by clients or customers and provide their insights into a company’s products and services so that the company can further improvise their existing and future line of products and services. Course feedback forms are rampant in academic and educational environments. These forms are basically questionnaires which need to be filled by students or even their parents so that the contents and quality of the course could be bettered for future batches. 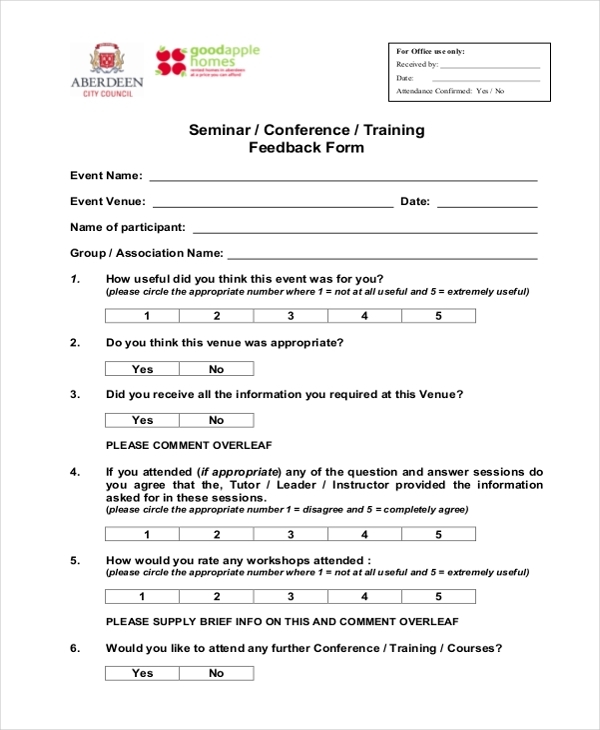 A conference feedback form is used for events such as seminars, conferences and training sessions. Usually, there is a lineup of questions which need be ranked or scored depending on the opinion of the attendees who were at the event. 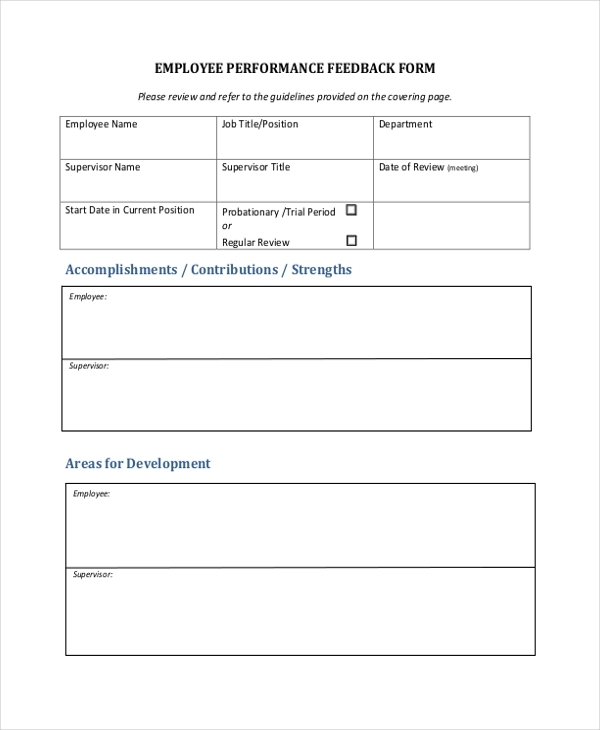 Employee feedback form is used by recruiters, HR managers and other relevant officials in situations when they are asked to rank or score an employee’s performance during a particular time period. The feedback form contains strengths, development needs, action plan etc. 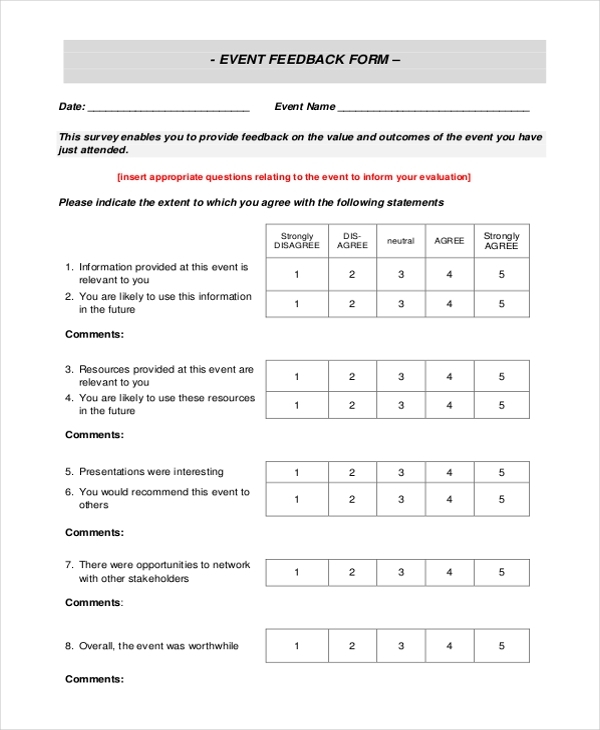 After the successful staging of an event, an event feedback form gets distributed to understand the kind of reception the event got from those who attended it. An event feedback form is universal and can be prepared with a variety of questions and pointers included. School and college teaching faculty members participate in workshops and training sessions. At the conclusion of the session/workshop, feedback forms are handed out to the participants and get their feedback about the quality of the program organized. Hotel feedback forms are used in facilities of hotels and hospitality sector. 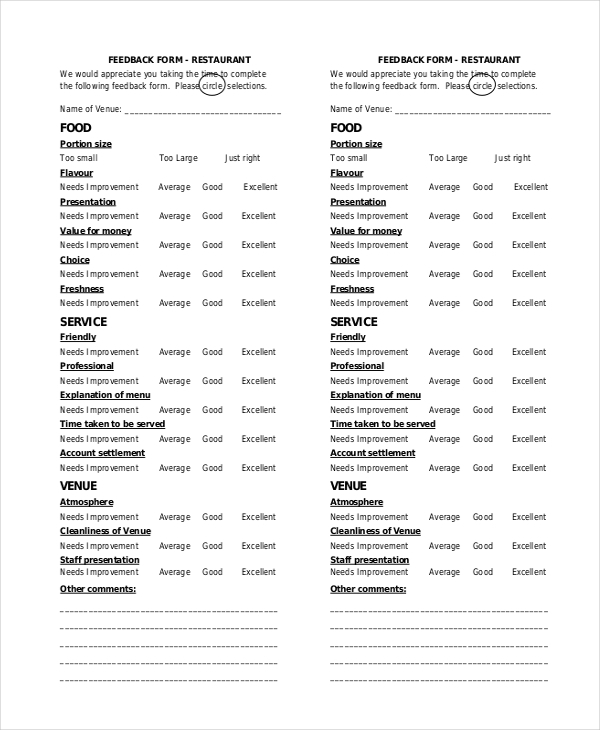 Customers and clients who may have come to stay in or dine-in are requested to fill up a feedback form scoring the various services and their quality for the management. 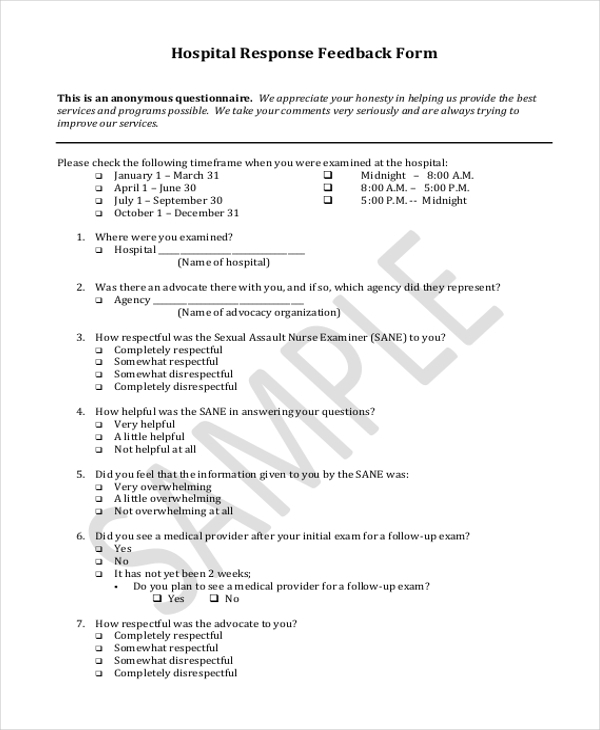 After a patient is successfully treated and has gotten discharged, the hospital management serves a hospital feedback form where the patient or his kin provide their feedback on the qualitative attributes of the hospital, including the quality of services, behavior of doctors, nurses, wards etc. After the interview round of a potential candidate has concluded, recruiters or HR managers populate an interview feedback form to specify the high points and low points of the candidate featured in the interview. Based on the remarks, the decision of recruitment is made. Internship feedback forms are given to interns for expressing their views about the internship program which has just concluded, or one that took place in the recent past. 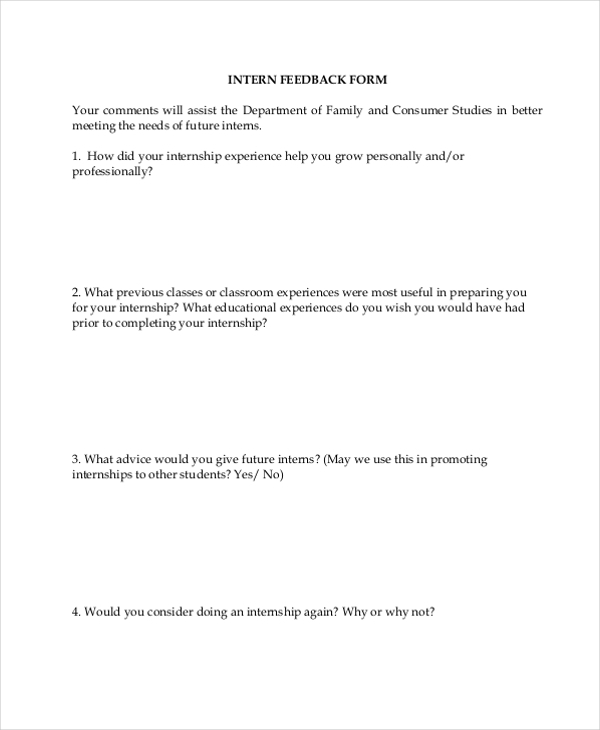 Internship feedback forms are dominantly used in academic and corporate environments. Even managers want and deserve feedback. In order to decide the way forward for a manager, companies place great importance on the comments and remarks seen and read in manager feedback forms. 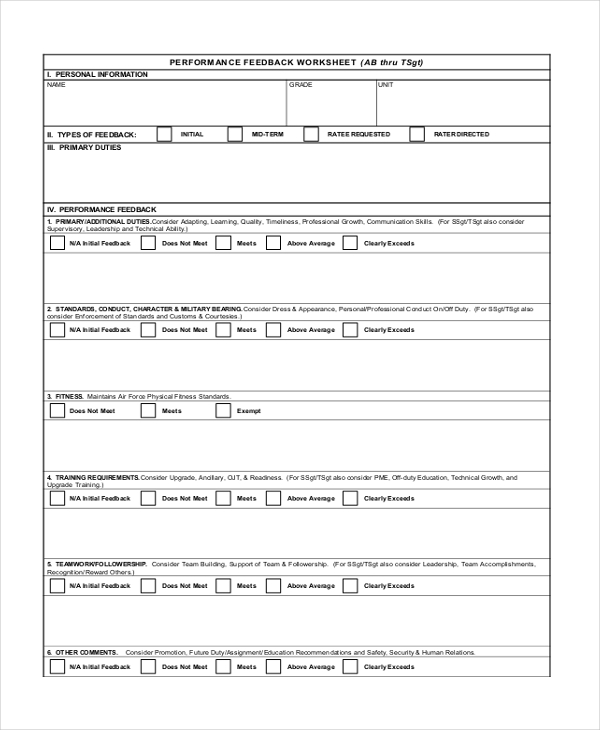 This form highlights the strong and weak suits of a manager and gives an accurate idea about the course of action the company must take with regards to his or her employment. Be it in classroom or boardroom or auditorium, critiquing a presentation is the norm. This is accomplished by means of providing relevant feedback and opinion in a presentation feedback form. 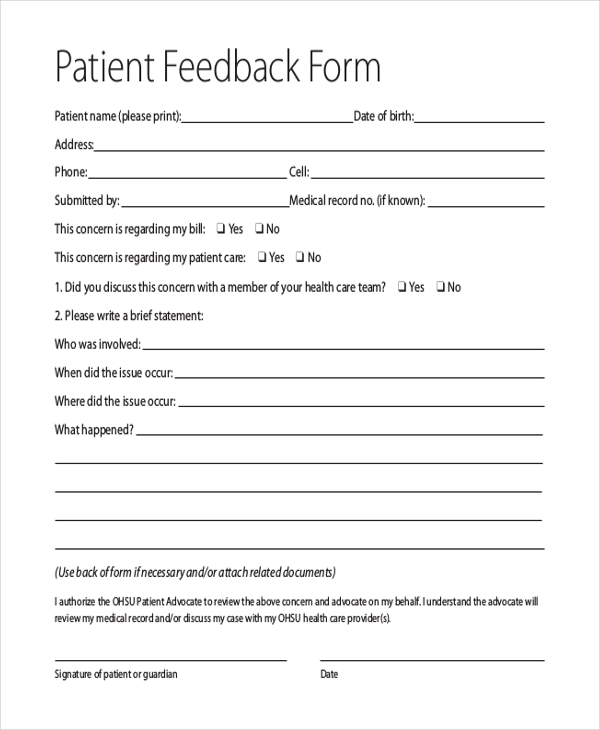 Patient feedback forms are prevalent in medical and healthcare facilities. These forms are given to patients to indicate how good or not good the facilities and services of a medical/healthcare outlet really are. Performance assessment of an employee working in an organization is usually done by means of a performance feedback form. The performance is adjudged on the basis of ranking or ratings earned on different specifics or parameters. In order to bring about an improvement in existing product lines, companies and businesses are motivated to request the customer to give their valuable review and inputs in a product feedback form. 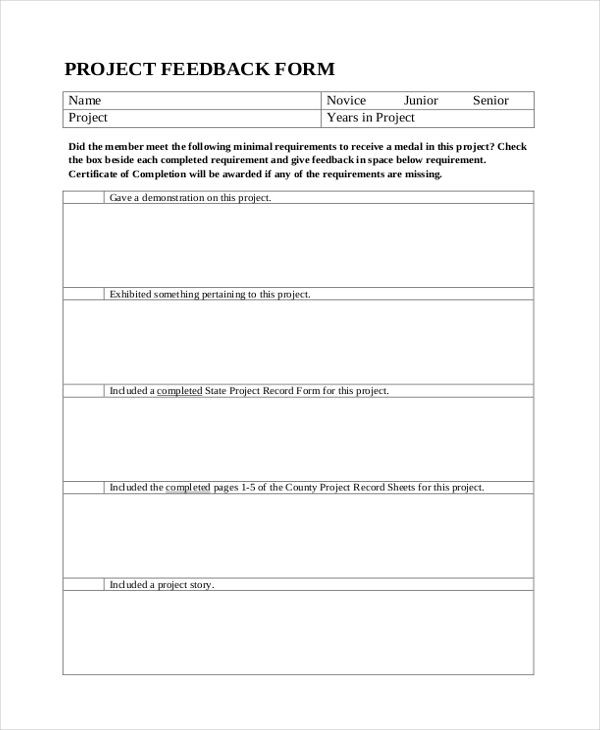 Whether in professional settings or academic scenarios, project feedback forms are routine. These forms are used to create or have an understanding about how well a project has been assessed and received by the concerned audience or stakeholders. Project feedback form covers various pointers which are ranked or rated to signify the success or failure of a project. After dining in a restaurant, the management would like to know what the diners’ think of the experience. 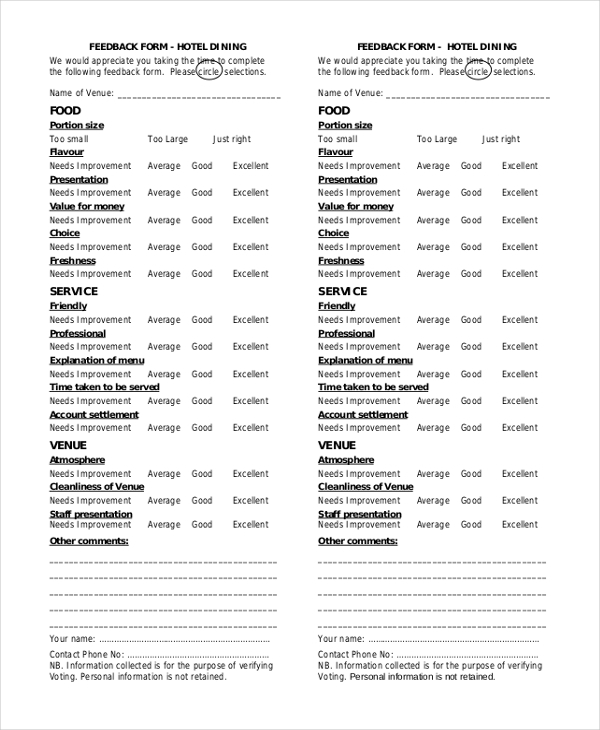 For this purpose, hotels, restaurants, and other eating joints encourage customers to give their feedback about the restaurant’s service and food in a restaurant feedback form. 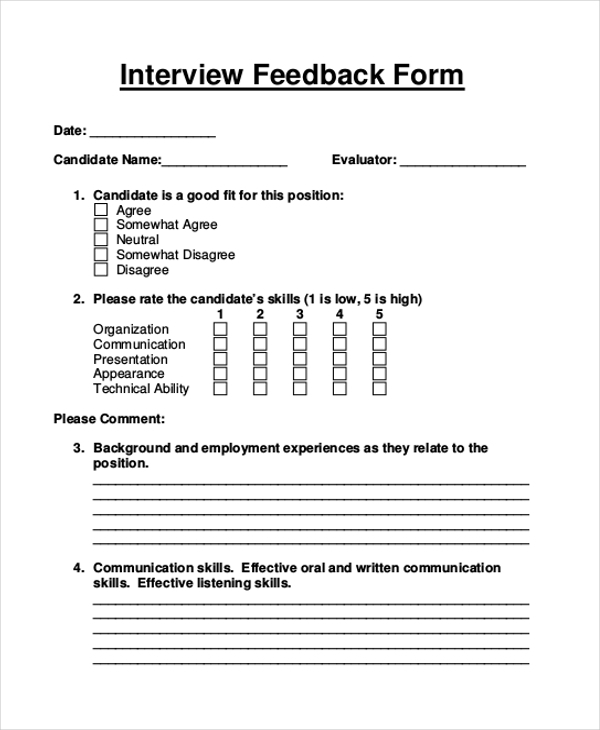 Recruitment feedback forms are generally utilized recruitment offices and agencies. These forms are a great yardstick for measuring the quality of services being delivered to clients and customers, and whether or not they are happy with the recruitment process and offers which are being offered. 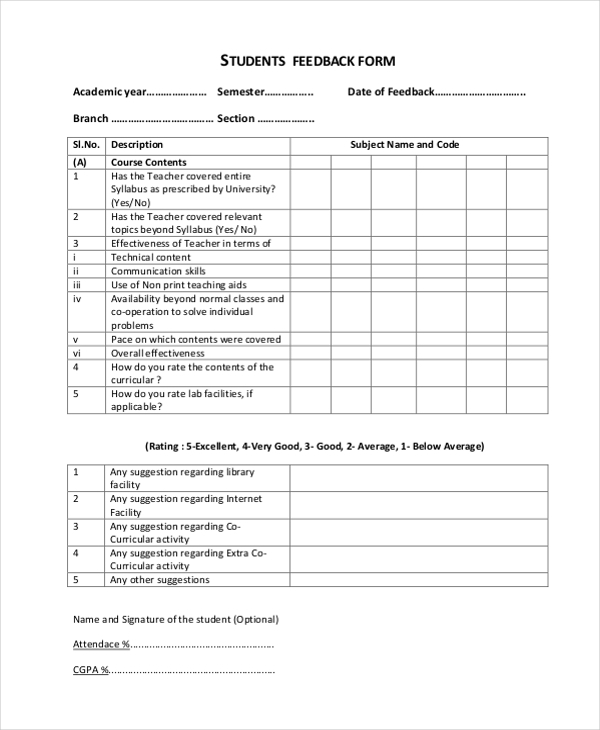 At the end of a teaching year or semester, teacher feedback forms are circulated amongst class or batch students. The form serves as a platform for students to give their feedback and views with regards to a teacher’s performance and prowess shown which they displayed during the course of the year, semester or program. 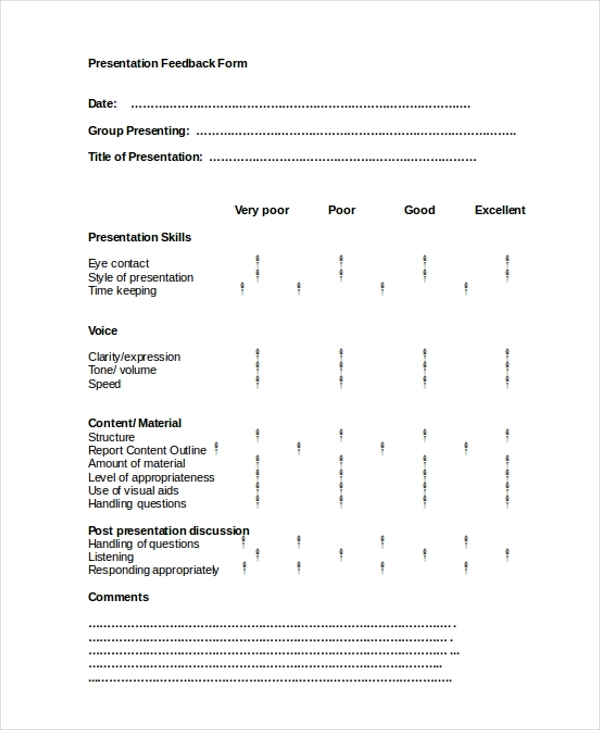 Seminar feedback forms are useful in seminar events. Post-event the attendees are requested and expected to rate how well or not the event was conducted; also their views are sought on the areas which need more improvisation. 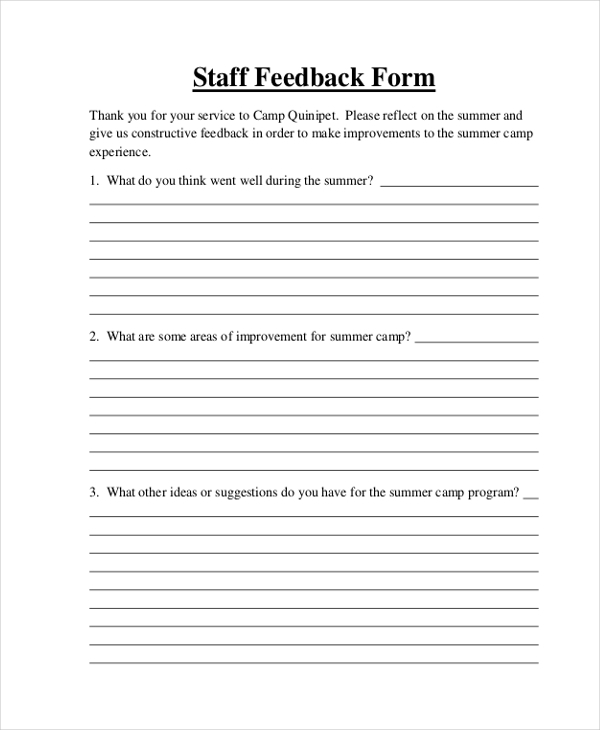 Staff feedback forms are useful in many work environments, including schools offices and even summer camps. These forms are question-based. The users are required to pen down their views elaborately. Questions could be specific or generic in nature. 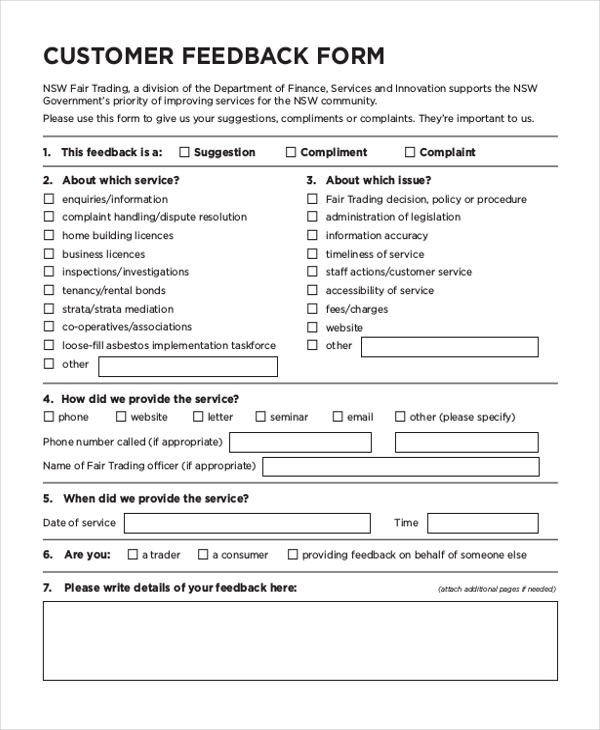 Training feedback forms are documents which are distributed amongst trainees after the completion of a training program, workshop organizers seek feedback from trainees on feedback forms which get distributed to them post-event. The target audience for feedback forms is quite vast. The forms can be used very advantageously in many situations. 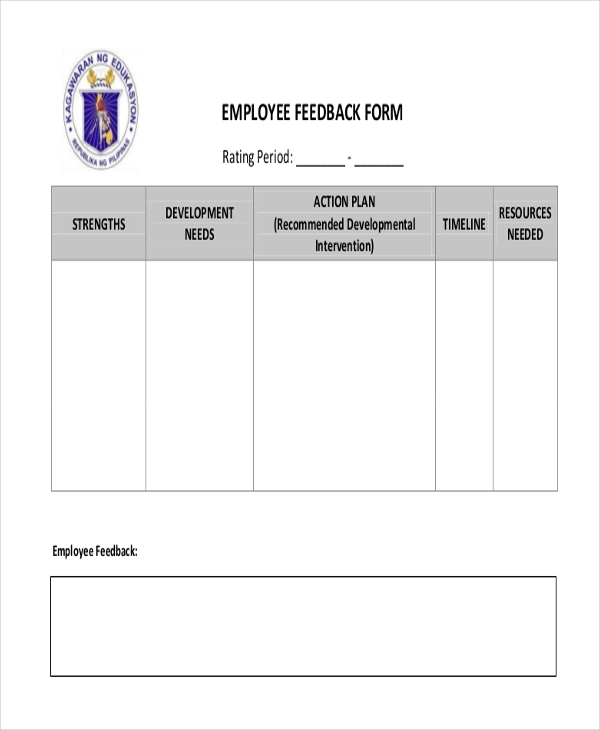 Be it related to teachers, employees, patients or students, feedback forms are of great necessity and drivers of improvement and development in different sectors. Not just that, businesses and brands place great faith in feedback forms. The opinions and views enlisted in these forms go a long way in determining the future paths and prospects of the brand and business. There are numerous reasons why so much importance is attached to feedback forms. Firstly, they lead to a boost and further improvement of product and service. Secondly, feedback forms provide actionable information that can be used to initiate improved customer experience. Most importantly feedback forms are a reflection of customer satisfaction. The survey results will let know them how well or poorly customers are thinking of their work. Feedback forms are primarily used to gather actionable information from different target groups. The information is then studied and reviewed by concerned authorities. Based on the material gathered through feedback, authorities chart out a plan of action and act upon the opinion, suggestions and expectations given. The ulterior motive of making and using feedback forms is to improve, develop and uplift. Feedback forms are the need of every organization – irrespective of which field it may belong to. Businesses thrive on feedback and that’s why feedback forms are a must. Over the years, feedback forms have evolved greatly – they are no longer simple questionnaires. Companies and organizations have grown smarter and that’s why they are using newly-designed and formatted feedback forms to gather opinion from their target audience and customers.